Even I cannot comprehend it; these ordinary people, extraordinary in their bravery, fighting off the gruesome beasts of an ugly regime that refuses to die. Two years ago, these ordinary people, these protesters took to a street off of Tahrir Square, facing security forces for four days in some of the most brutal clashes the country had witnessed since the eighteen day uprising. Some of the biggest questions about the Mohamed Mahmoud clashes persist to this day. What was the point? What did they aim to achieve? These don’t seem to be the important questions to ask. The clashes were a result of the courage of revolutionaries who confronted a regime adamant on playing dumb. The revolutionaries never took aim.They simply fired and the result was a tragic triumph, perhaps as all great triumphs are. It’s not accidental that, on November 19, 2011, the police, the epitome of the tyrannical state, aimed at unarmed protesters’ eyes. The regime was unable to hide behind its lies. Those in Mohamed Mahmoud were there to send a message: we see you, we can see past your lies. Unable to hide, the regime chose instead to blind those looking on. 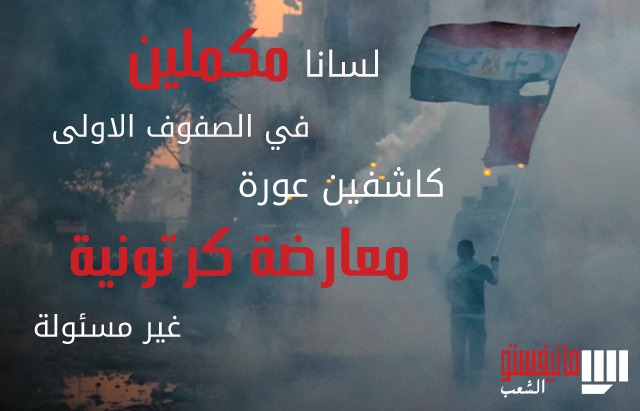 That’s why the streets of Mohamed Mahmoud were filled with blinding teargas, and yet the response from the people was brave and resilient, refusing to retreat. 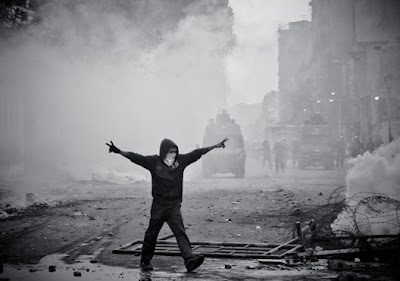 Instead of backing down and retreating to the relative safety of Tahrir, protesters, armed with little more than their integrity and handfuls of rocks made their choice. They chose to open their chests to bullets, were open to death, fighting for a great many who were already blind or too scared to fight for their right to keep seeing, to keep looking. The best of us died in November 2011 and little by little, all that’s left of us now are the worst. That’s what happened to the revolution; the worst of us survived and now we’re unable to do what the many brave protesters in Mohamed Mahmoud did two years ago: choosing to see. Now the worst of us play politics, make tactical calculations and gang up on the few remaining revolutionary spirits. One year passed after the clashes in Mohamed Mahmoud, and the few brave ones that survived returned to the same place, and in continuing to tell the regime they can still see, they faced a similar fate.Gaber Salah, better known simply as Jika was gunned down. He was 17. Jika’s funeral was the largest I have been to since the start of the revolution. In a silent procession towards the graves, people marched as though mourning the death of the last of us. On the way back, once again they defiantly chanted against his killers. In truth we’re not as strong as those who died. We’re the remnants, we’re the ones who stayed behind, and that’s why the revolution is faltering, because they’ve taken the best of us. As weak as we are, we need to at least hold on to the values of the brave people who died. We need to hold on even if we can’t fight for them as hard as they did, that’s the absolute minimum we can do. How many masked strangers have thrown back tear gas canisters under heavy fire? How many of them have fended off thuggish attacks? How many have taken a bullet for you? This is not an attempt to romanticize Mohamed Mahmoud protesters as individuals, they are who they are, ordinary people with all their flaws, but extraordinary in their choices and sacrifices. On the streets of Mohamed Mahmoud, I saw who I like to call Jika’s friends, the little hope remaining in our revolution. They’ve been let down by everybody, by the Mubrak regime into which they were born. They have even been let down by the older generation who chose to confront Mubarak. They’ve been let down by the so-called revolutionaries because a great many of them don’t realize that Jika, and those like him, are the real revolution; they are its hope. They have played politics or spend their time on social media, promoting an unfinished revolution rather than going out to finish it. What you see should change you, and I have changed. I know who I’d rather be loyal to. I’d rather be loyal to the fallen and their ideas. I’m one of the weak ones that survived, I cannot fight as bravely as they have, but I do know this, with whatever little strength I have, I will continue to fight, even if it’s a fight I’m destined to lose, for a country that has given its children so many funerals. We have nothing left to do but try our best in all our weakness to do what the lions of Mohamed Mahmoud were doing: keep looking. We should not swallow the lies that ask us to look the other way, nor accept the myth that now is not the time to speak the truth. We should never accept the joke that maybe things have changed without anything really changing. We have nothing left to do but look, even if they once again, take aim for our eyes. First published on Atlantic Council's Egypt Source blog.